Find hotel near Historisches Museum Barfu ..
With its exteriors as impressive as the interiors, the History Museum leaves no stone unturned to wow you! Housed within a 14th century church, the Church of the Shoeless Friars, no places chronicles the city’s past as well as the History Museum. 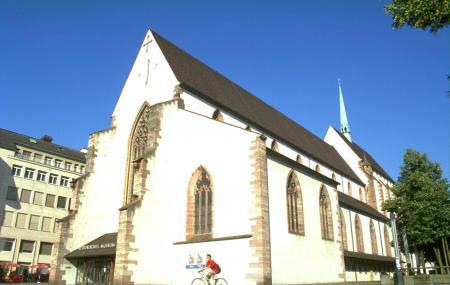 The primary exhibits here focus of Basel’s cathedral treasure troves- tapestries, wooden sculptures, a 16th century choir stall and ecclesiastical works of art, to name a few.The gallery next to the choir and the underground lair too have some fascinating exhibits. Entry is free for children under fighteen years. Love this? Explore the entire list of places to visit in Basel before you plan your trip. Fancy a good night's sleep after a tiring day? Check out where to stay in Basel and book an accommodation of your choice. How popular is Historisches Museum Barfusser Platz? People normally club together Spalentor and The Cathedral Munster while planning their visit to Historisches Museum Barfusser Platz. Nice setting in Historic church, so many beautiful pieces to look at. Some have complained about there not being English translations on most of the plaques, that is true I did see some though. I used a google translator app and that did pretty well. The women at front desk was very nice and even saved me 50% off the the admission price. Much to see, still was under some construction at time I went. Beautiful museum that makes good use of its location in an old church. Limited English translations available, which made it difficult to understand some sections. Plenty of visual interest made it with while though, particularly in the lower level. A great place to get goosebumps.